As a bride planning her wedding, you may already have ideas of what you want to wear on your big day. 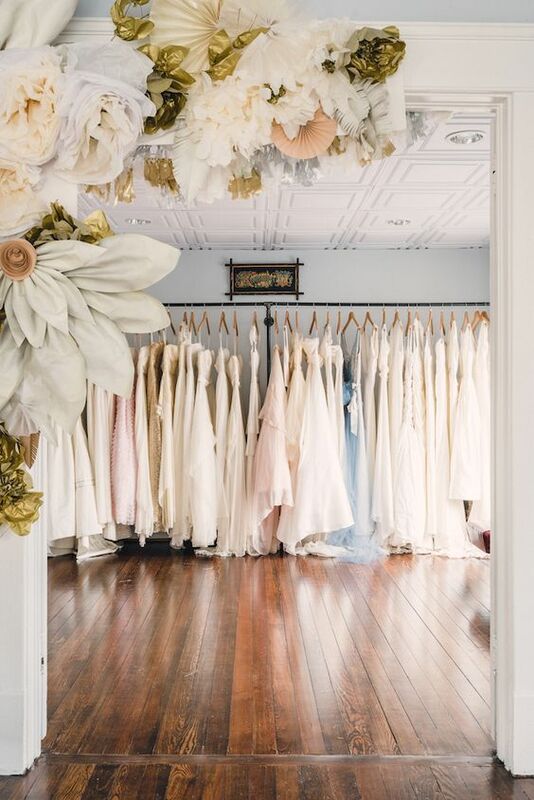 It may all be up in your head, or you may even have pictures printed out, but do you know what it’s like to actually shop for a wedding dress? If this is your first wedding, then the answer is probably no! Wedding dress shopping is totally different than the regular type of shopping you do for everyday fashion. Here are a few etiquette rules to keep in mind as you skip into the bridal salon. One of the best ways to totally kill your wedding-dress-shopping buzz is to head into a gorgeous salon on a whim with friends and be turned away because you didn’t make an appointment. Again, wedding dress shopping is not the same as just popping into the department store and searching for a party dress. It is a much more in-depth and serious process (although, it should also be fun, of course!). Salons have a limited number of dressing rooms and you are typically not allowed to just shop and try-on on your own. 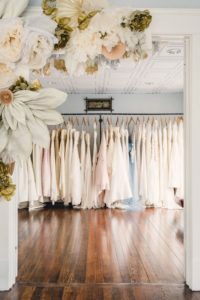 Bridal consultants are on staff and are assigned to each appointment to help the bride choose dresses, pull the dresses from stock, and help them try them on. Make sure you call at least a couple of weeks before you want to head into the salon and make an appointment. This way, you can make it a fun experience with your mom or with friends and not have to worry about not being able to get in. We know that you’re the star of the show right now and that your wedding day is all about you, but you have to remember that you won’t be the only bride trying on dresses at the salon. Take a few moments to imagine how you would want to be treated and respected by the other brides, and then commit to displaying that type of behavior yourself. We’re not saying you can’t have a blast, laugh, and cry with your friends, but use your common sense and avoid excessively loud voices. And, of course, never talk badly about another bride in the salon and the dresses she is trying on. Just imagine how you’d feel if another bride did this to you! If you don’t feel comfortable going au naturel with your makeup for your bridal appointment, wear only minimal, light-weight makeup to avoid getting it all over the dresses as you change in and out of them. Keep in mind that the gowns in a salon are samples, are used in every appointment, and may be the only one the salon has in stock. A heavy eye, intense bronzer, or bright red lipstick may look gorgeous on you, but it won’t be pretty all over a white dress—that isn’t yours! The bridal consultant that you work with at your appointment will be thrilled to help you find your dream dress. But, chances are, you won’t be the only bride they get to help that day. So be respectful of their time and the other appointments in the salon. If you only have an hour and a half, take note of that before you even go into your appointment, ask your concierge to keep track of the time, and don’t force the consultant to awkwardly rush you out so that they don’t miss their next appointment. When it comes down to it, think about how you would feel if your consultant completely missed your appointment or cut it in half because the bride before wasn’t respectful of the time. Finally, and possibly the most important etiquette tip is to never be too late for or no-show your wedding gown appointment. The salon is assigning you to a consultant that is blocking out a chunk of their day to work specifically with you and the salon may have had to turn down brides because of your appointment. Five to ten minutes should be okay for being late because some times you just hit every red light or there was some unexpected construction on the way. But any more than ten minutes, be sure to call the salon to let them know that you’re on your way and to ask if it is still okay you come in at all. If you’re going to be thirty or more minutes late, they may have to reschedule you for another day. And you wouldn’t want your appointment cut in half anyways. As for no-showing, it just is disrespectful. If you’ve been dreaming about what it’s like in that salon and you know you absolutely want to try dresses on there, it may be incredibly awkward to schedule another appointment for another day. And after so many no-shows, a salon may prevent you from making an appointment. Remember, these are simply etiquette tips and shouldn’t be complicated to follow. At the end of the day, shopping for your wedding dress should be a fun and stress-free experience that you cherish forever.